“A mystery is only a high-sounding term for a muddle.” declares a character in E. M Forster’s A Passage to India. Forster’s characters do seem to have a propensity for muddles. In A Passage to India it’s the sensation felt by a group of British visitors to the country. One of them, a young schoolmistress intent on seeing ‘the real India’, becomes so confused by what she actually experiences that she ends up falsely accusing a local doctor of sexual assault. 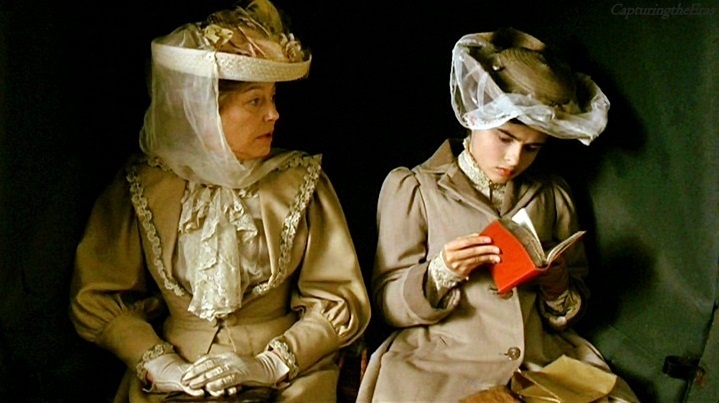 In his earlier work, A Room with A View, the muddle is the confusion felt by the main character caught between conflicting emotions: does she follow a life of conformity to Victorian values or embrace a life of passion even if its with a man whose social status makes him ‘unsuitable’? What Forster means by ‘a muddle’ clearly varies between the two works. In A Passage to India it denotes the failure on the part of a group of British travellers to India to understand the essence of a whole nation. Forster’s point is that the Westerners are seduced by the country but also confused and try to make sense of its chaotic nature by categorizing everything they see — what they fail to understand is that India is too great a melting pot of cultures, castes and religions to be easily labelled. A failing of understanding also lies at the heart of A Room with a View. When Lucy Honeychurch visits Italy with her prim and very upright cousin Charlotte, she is unprepared for her encounters with the unconventional, lower class Emersons, a father and son who are staying at the same pension. Nor is she prepared for the passionate intensity of people she experiences in Florence. Her senses shocked but stirred by a stolen kiss from George Emerson, she flees Florence. Back home in the idyllic family home at Windy Corner, she drifts into an engagement with Cecil Vyse. It’s a good match since he’s from a better class than her own even if he is obnoxiously condescending most of the time. But when the Emersons arrive in the neighbourhood, memories of that time in Florence are re-awakened in Lucy. The tension mounts between her passionate desires and the conventions and expectations of the class and worlds she inhabits. It’s left to the kindly clergyman Mr Beeb, to give voice to her dilemma. It seems to me that you are in a muddle. Take an old man’s word, there’s nothing worse than a muddle in all the world. … It is on my muddles that I look back with horror — on the things I might have avoided. I used to think I could teach young people the whole of life but I know better now and all my teaching …. has come down to this: beware of muddle. To clear up the muddle requires Lucy to change her point of view. Her happiness also depends on her chosen partner sharing that view. Cecil’s inability to do so signals that he is not the right man for her. When I think of you it’s always as in a room, she said. To her surprise, he seemed annoyed. A drawing-room, pray? With no view? Yes, with no view, I fancy. The “view” contained in the novel’s title thus has a symbolic resonance. Significantly, the book begins and ends with the same physical view seen from a room in the pension in Italy. Forster apparently struggled to write A Room with a View because he couldn’t decide whether it should end on a happy note. Without giving the game away, it’s fair to say that he chose the conclusion that best fitted his theme of personal growth. It’s a tightly written story with some finely drawn characters — I particularly warmed to Lucy’s cousin Charlotte with her unquestioning belief in the need to uphold what is “proper” and to protect her niece from the upstart Emersons. It feels however as if Room with A View is just a warm up for the more substantial main course of A Passage to India. Posted on March 13, 2014, in Book Reviews, Classics Club and tagged E M Forster. Bookmark the permalink. 14 Comments. A very nice overview. One small quibble: the quote about “muddle” that you attribute to Mr. Beebe is actually spoken by Mr. Emerson. Lovely review. This is one of those books I’ve been meaning to read forever. I really enjoyed this book and your fantastic insight has given me some of my own! Have you read ‘Howard’s End”, which for me is the pinnacle of Forster’s work. Damon Galgut, the very fine South African writer, has just just published a novel, ‘Arstic Summer’ which is about Forster’s own experiences in India and his own muddle about his sexuality. It’s very high up on my must read list. Yes I’ve read it a couple of times Ann. I rate it highly though Passage to India pips it for me, largely I think because I seem to be a sucker for books set in India. Galgut’s book sounds a treat.Let me know what you think of it. I am actually reading this book at the moment; I picked it up on a whim two days ago. Cecil reminds me so much of Mr. Collins in Pride and Prejudice. I am not sure why, since they are such different characters. I will have to read further to decide whether Forster wants me to find Cecil ridiculous or not. I hadn’t really thought of him in that way – more of a figure that is held up as an example of the kind of attitude Forster was arguing against. Now that I have finished the book, I agree with you. Cecil is not meant to be ridiculous, just an example of how not to be. I very much like Room with a View. I love Mr. Beeb and the Emersons. And I am glad Forster went for the happy ending :). I’ve not read Passage to India. Must do that! Mr Beeb is a sweetie and I did like Mr Emerson. His son never really materialised for me though. Do give ‘Passage’ a go at some point Stefanie.